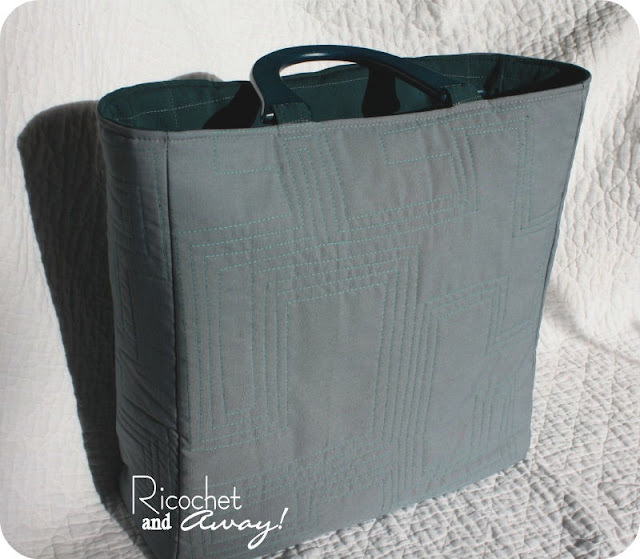 Update: You can see all 18 of the finished totes and voter for your favorite HERE. Anyone can vote once a day until Dec. 31st. 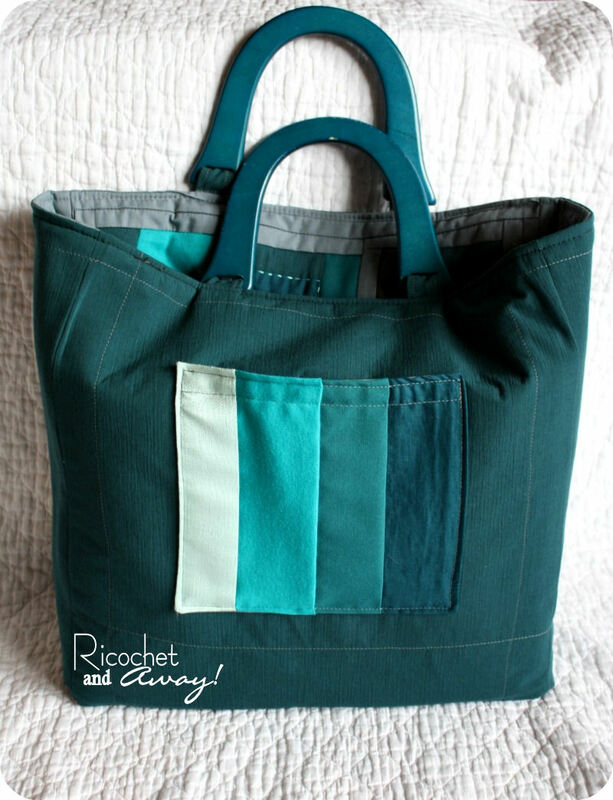 Keren from sew la vie and I have been very busy lately hosting The Solids-Only Tote Challenge! You should visit the challenge homepage, read about the challenge guidelines, and meet all the challenge participants. Including the hostesses, we have 19 participants!!!!! [insert girlish squeal!] Yes, 19 talented people from all over the world!!!! It's very exciting, isn't it? First big idea: Patchwork. I've been obsessed with quilting lately. Mostly due to Keren's influence, I should add. I made quilts for my son and daughter. 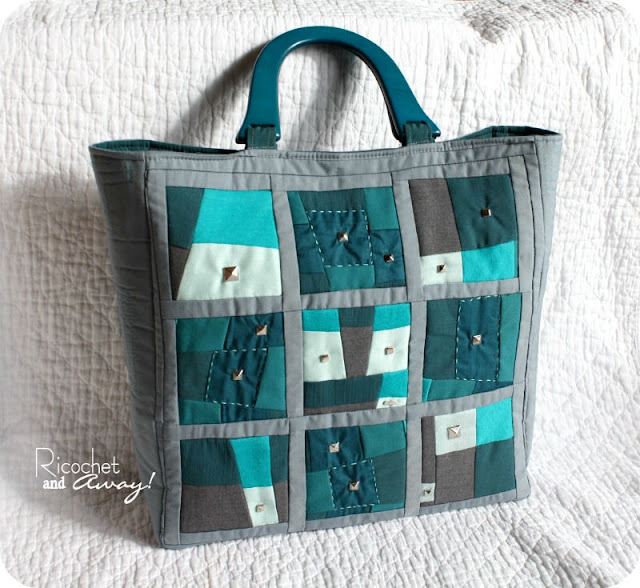 So, with quilting on the brain, patchwork was a gimme. Big idea number two: Don't buy any new stuff! I have plenty of everything and don't need to go out and buy anything new. In fact, this really should have been my first big idea! Quilters everywhere are cringing as they look at the fabric I chose to work with. No 100% cotton quilt-weight fabrics for me. For starters, I have a jersey and a stretch suiting in the mix. 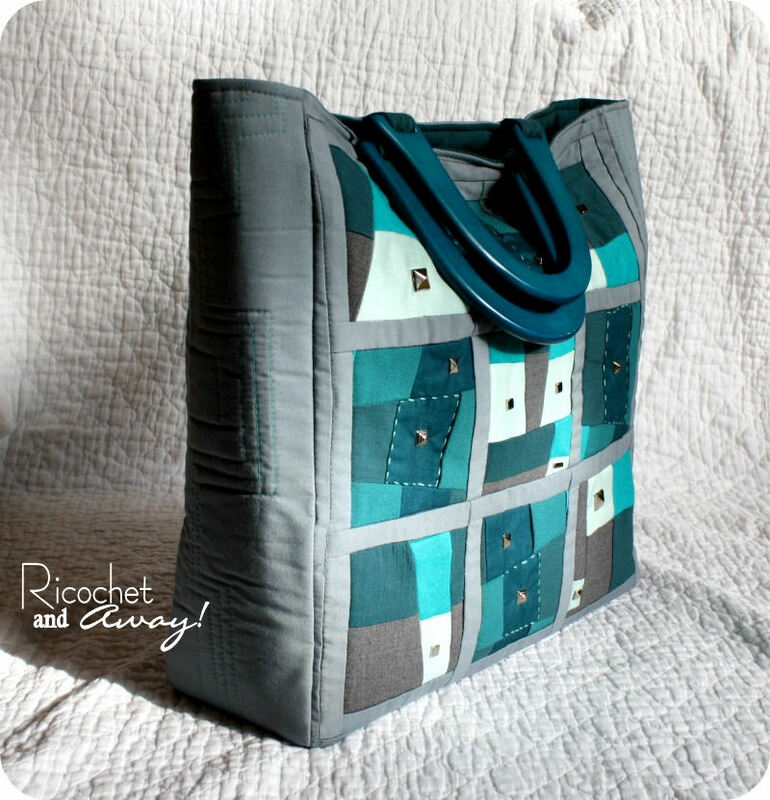 Sewing stretchy to non-stretchy is not what savvy quilters do. But I figured I'd give it a try because the colors were so great. Hey, what's a challenge without some actual challenge? Perhaps I was shooting myself in the foot, but I was feeling daring enough to risk it. Another big quilting no-no is to mix weights of fabric. My fabrics ranged from a wispy crepe to a heavy upholstery fabric. But again, I saw the colors together and couldn't help myself. First step was to cut some strips and sew them together side-by-side. Then, I cut the blocks into triangles, rearranged them, and sewed them back together again. The pic above is what it looked like when I got to that point. I then cut nine 5" squares out of it. 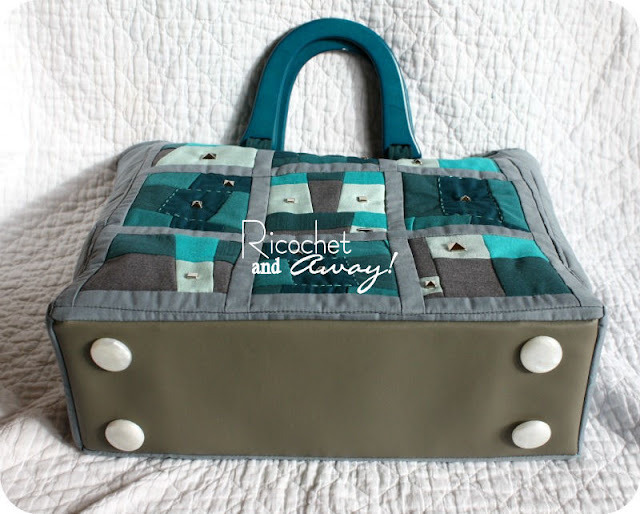 I added the gray sashing between the squares and the hardest part was over! Did I run into some problems? Well, yes I did. My choice in fabric made it difficult to iron down the seam allowances and keep everything nice and flat. There is some wonkiness and puckering as well. Not enough went wrong for me to admit that I failed. However, I do admit that I've learned my lesson, and will make more prudent fabric choices in the future! The backs and sides were machine quilted in a pretty turquoise thread. I wasn't sure I had enough thread to finish the all the quilting, and I didn't want to buy more. Sticking to my don't-buy-anything guns, I used up all my half full bobbins for the quilting. So if you were to see the back side of the panel up there, you'd find orange, purple, black, and yellow bobbin thread. It felt good to use it all up. I wonder if you all save your unused bobbin thread. Do you store them or empty them out after a sewing project? I'm curious. This part was pretty fun. I got out all my square buttons and studs and coordinating embroidery flosses. It took a lot of fiddling and second guessing, but eventually I narrowed it down to one color of floss and the studs. And here is a nice view of the embellished front. I found a scrap of vinyl to use for the bottom and some teal wooden handles. Phew! This is turning out to be a long-winded post. I'm going to just chill at this point and show you some pics of the finished tote. Just leave a comment if you have any questions. The easiest way to show the inside is to turn it inside out. I used big ol' plastic buttons for feet. That was a lot of pictures! I hope it didn't take too long for it to load up. Thanks for sticking with me! November is the month to count your blessings and reflect on all the things you are thankful for. I am so thankful for all my readers out there. Thanks for taking the time to browse through my posts, for leaving lovely comments, and for telling others about me! You rock! I really like it, all the different hues that go so nice together. I also love the quilting on the back, just small detail like that make it extra special! But I am following all the progress and loving it! How game are you, Rikka, putting crepe and stretch suiting together!!! It paid off; the colours work so well together. 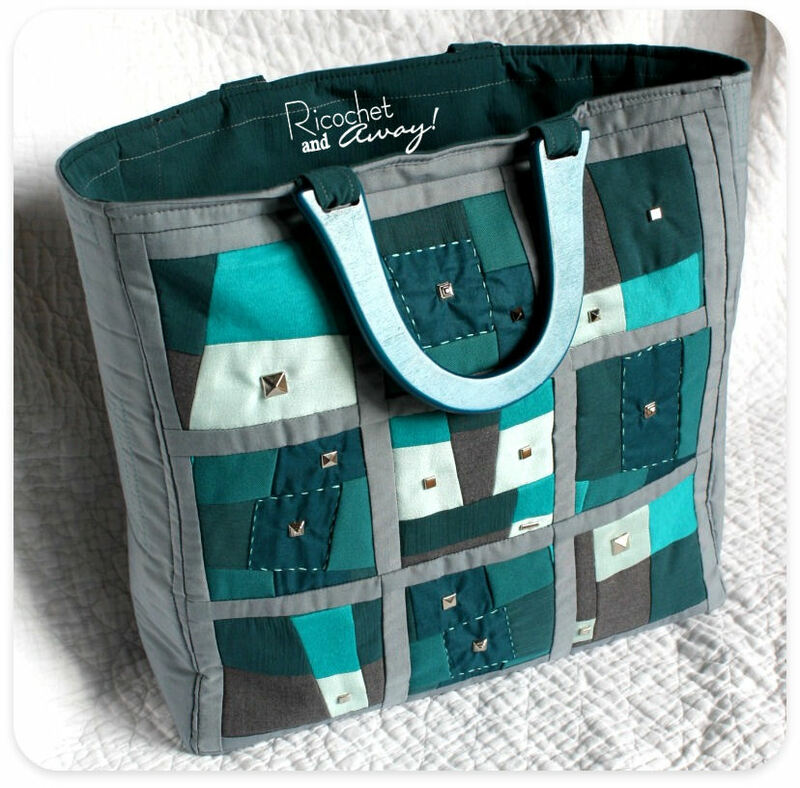 Everything works well: the offset quilting, the grey sashing, the studs, the hand stitching. I love it!!! Oh and the handle; fancy having the perfect coloured handle in your stash. Re bobbins; I have LOTS of bobbins, so I have a different bobbin for each thread colour, so no wasted thread. For appliqué work I use bobbin fill. Your tension must be perfect to use different bobbin coloured thread!!! When I only had a few bobbins, I used to put the new thread colour on top of the old and I'd end up with a bobbin full of different threads and at some point I'd need to unwind it by hand to make room for new... LOL!!! Oh my goodness this is just stunning!! I really like the coolness of the gray color and the pop of turquoise and blues! I am also a rule breaker when it comes to quilting and often pair all sorts of fabrics as I am going to for a certain texture. So very well done!! Great post! I like the square brackets with the squeals and stuff :-) Your tote came out lovely and super professional. I like the inside too. 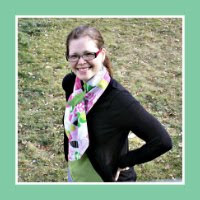 After reading about the creative progress I am even more impressed: Quilting with jersey?? 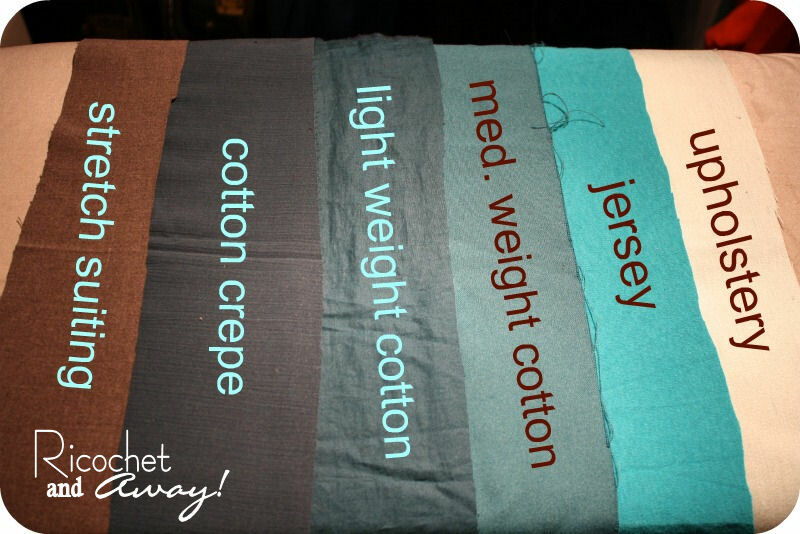 Mixing fabric weights?? That could have turned into a quilter's nightmare. You were so brave to try that out. Like you said, what kind of challenge is it if you don't head for the unknown and try something new and even unacceptable? As for bobbins: I too, like Pam, have a lot of bobbins (20? 30?). I hardly ever throw away the bobbin thread. Many times I go back to use a color I had used for a project long ago, so I use the bobbin with the thread left from back then. Gray is the new black! Beautiful combo of colors and textures. 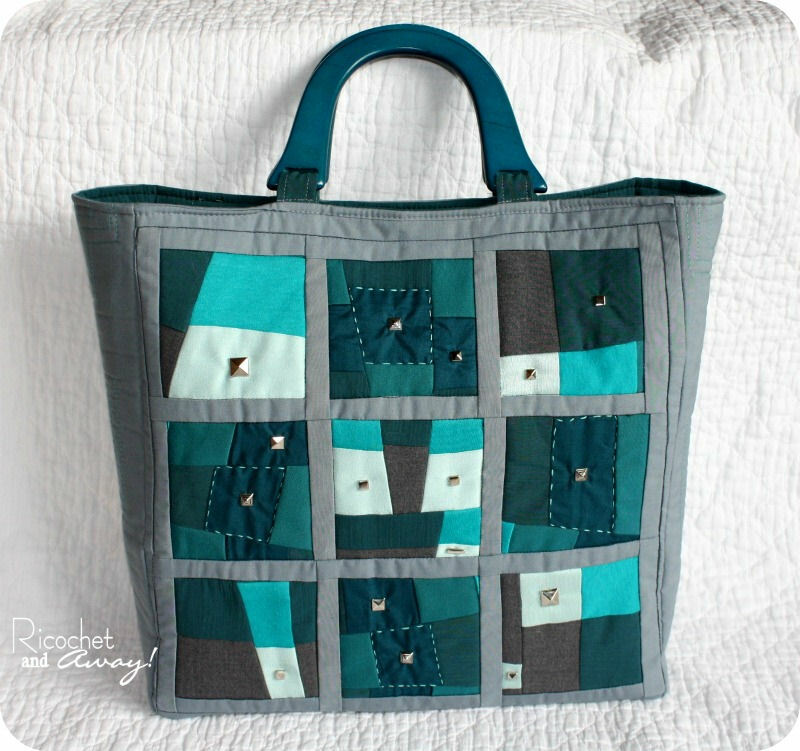 I love that you used different fabrics, it gives the whole bag character. I love the colours and the shape! Maintaining your sewing machine . . .